Goldfinches during our Saturday snowstorm. A system arriving Monday night could easily be the biggest storm of the winter, and it is likely to bring significant snowfall with strong winds. The National Weather Service issued a blizzard warning for Rockingham County and Strafford County for Tuesday. The strongest winds will likely be at the Seacoast and range from 40 to 60 mph. eNature: Where do the birds go for protection during severe weather such as blizzards, hurricanes, and tornadoes? Garden Walk Garden Talk: How Do Birds Keep Warm in Winter? 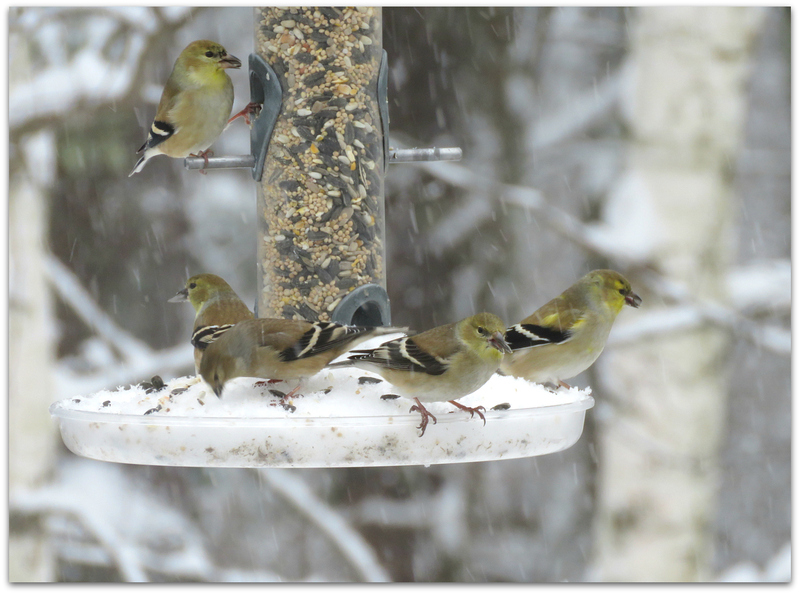 This entry was posted in Uncategorized and tagged American Goldfinch, birds, blizzard, winter on January 26, 2015 by Amy.